"Lena Olive Smith: Civil Rights in the 1930s," by Jackie Sluss. In Hennepin History, vol. 54, no. 1 (winter 1995), pages 28-34. Nellie Stone Johnson: The Life of an Activist, as told to David Brauer. St. Paul, Minn.: Ruminator Books, 2000. Consists of organizational files, subject files, and case files documenting the 1952 formation and subsequent activities of the Minnesota state affiliate of the American Civil Liberties Union and subsequent operational, educational, legislative advocacy, and litigious activities in the fields of civil rights and civil liberties. Restriction: Access to records less than 25 years old requires written permission. Also, quotation or publication, beyond the fair use provision of the copyright law, from records less than 25 years old requires written permission. The civil rights movement grew out of a century of grassroots efforts in a long struggle for racial justice. In Minnesota, the struggle was headed by leaders of the African American communities, including Fredrick L. McGhee, the Reverend Denzil A. Carty, Nellie Stone Johnson, and Harry Davis. Also essential to the struggle were ministers and congregations of black churches, editors and publishers of black newspapers, racial, interracial, and interdenominational organizations, and orchestrated legal challenges in the courts. Fighting for desegregation and against discrimination and the denial of the legitimate claim to equal human and civil rights were acts of courage in the prevailing climate of police brutality and lynching. Minnesota politician, Hubert H. Humphrey, joined the cause early in his political career. These scattered efforts began to coalesce at the end of WWII when African American soldiers, having risked their lives to save the freedom of the world, returned to the United States, only to find themselves deprived of equality and basic civil rights at home. 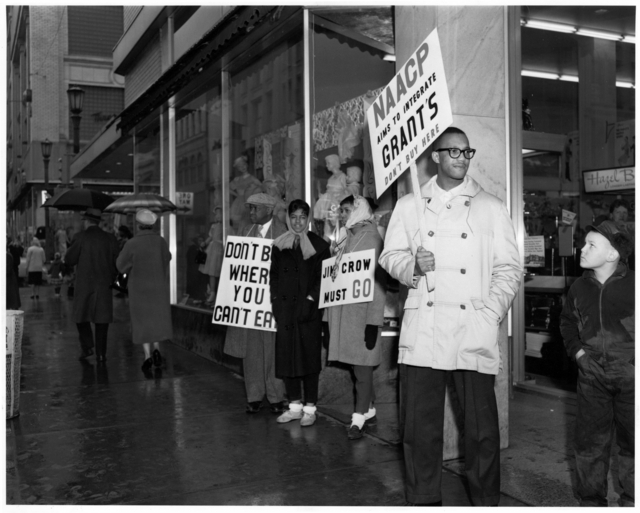 The National Association for the Advancement of Colored People (NAACP) and the Urban League — including their Minnesota chapters — joined other organizations in using legal, political, judicial, economic, and legislative means to gain full citizenship rights for African Americans.The Reverend Martin Luther King, Jr., and his colleagues in the Southern Christian Leadership Congress (SCLC), carried forward a moral crusade of civil disobedience and nonviolent resistance that began with the Montgomery Bus Boycott in 1955, spread through sit-ins and demonstrations, as local groups and their leaders joined the struggle, and succeeded, ultimately, in bringing about passage of the Civil Rights Act of 1964.